The Lyric Theatre and Cultural Arts Center is pleased to announce a new program to better connect with the East End Residents, 'East End Lyric Access.' This program was created by Tim Small, and will begin the summer of 2018. The 'East End Access' is a way for the Lyric Theatre and East End Residents to connect directly and support each other. This program was created in order to give East End Residents access to musical and theatrical events at the Lyric Theatre. 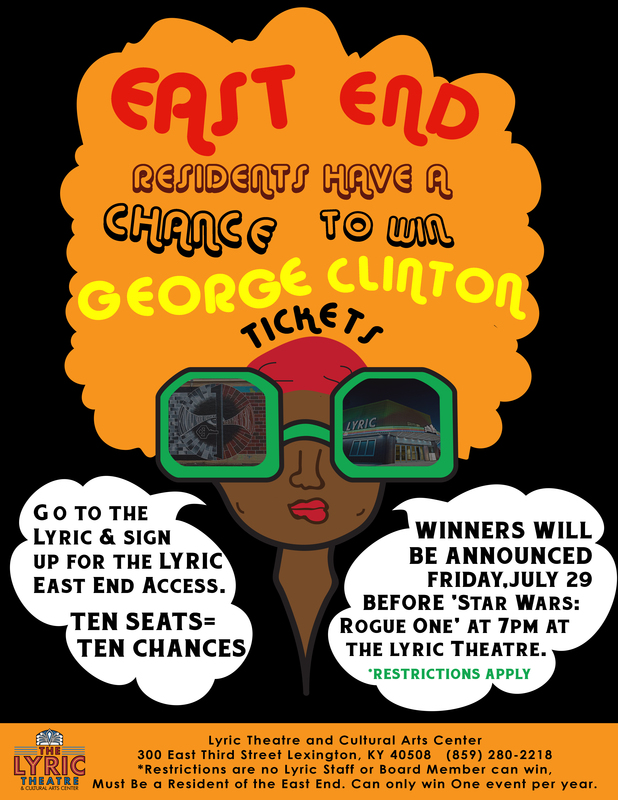 The Lyric Theatre will be giving away four seats exclusively to East End Residents. The Lyric Theatre will also be giving East End Residents first opportunity to sign up for our programs. Scroll down the page for upcoming East End Giveaways. East End Residents will only have to sign up once in order to be considered for the giveaways and will be chosen at random. Participants will only be allowed to win one giveaway a year, and will re-set at January 1 of the next calendar year. You do not have to be present in order to win any of the East End Access Giveaways, but upon receiving your tickets you will need to prove residency in the East End via ID, Utility Bill, or Mailing Address with your name on it. - Tickets are non-transferable and can not be re-sold. at the next calendar year on January 1. - Only can sign up once to be in the 'East End Access' and multiple sign ups are prohibited. The first ever 'East End Access' Giveaway will be tickets to the show 'George Clinton and the Parliament Funkadelic' at the Lyric Theatre on Thursday, August 23 at 8 pm. You must be an East End Resident and *Restrictions Apply (please scroll up to see the restrictions). Winners will be announced on Friday, July 29 before the Black Lens Summer Film 'Star Wars: Rogue One.' You do not need to be present in order to win. The second event for the East End Access is the Lyric Theatre's 'Learn To Play: Percussion Edition.' Residents of the East End will have the first opportunity to sign up for this free music class. For this edition, we will be learning percussion. The first class will introduce everyone to beats with bucket drums. Then the class will be able to choose which instrument they would like to use from bongos to maracas and much more. July 21 the 'Learn To Play' class will put on a performance for all to see. 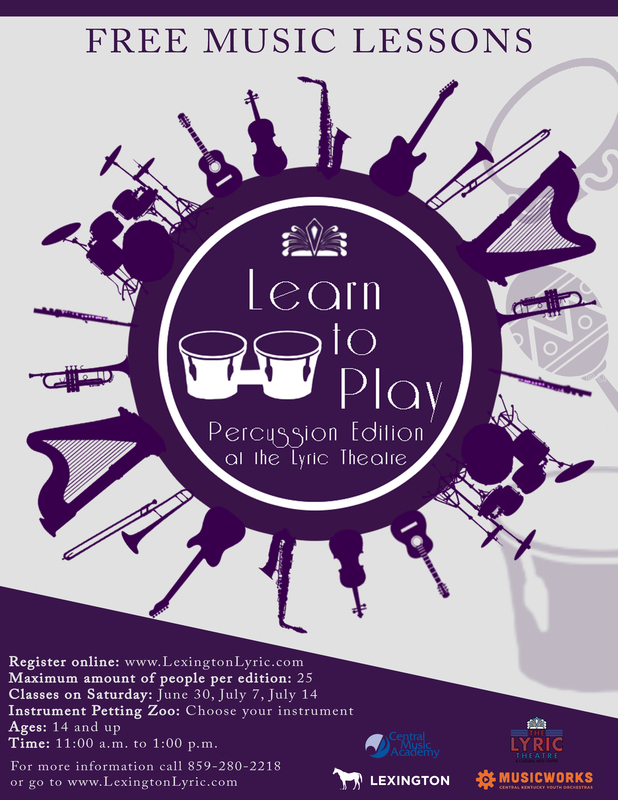 If you are an East End Resident and are interested in signing up for 'Learn To Play: Percussion Edition' please come to the Lyric Theatre to fill out a form, call the Lyric Theatre at (859) 280-2218, or fill out the form below.